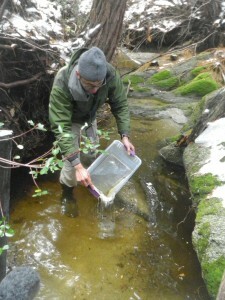 Endangered tadpoles were released into a stream near Idyllwild, Calif., today with hopes that the Southern California population of the mountain yellow-legged frog Rana muscosa will thrive again. This is the second release of tadpoles into the same stream at the University of California James San Jacinto Mountains Reserve in Riverside County, which is part of the University of California Natural Reserve System. The release was done in collaboration with partners including the U.S. Geological Survey, U.S. Forest Service, U.S. Fish and Wildlife Service, the California Department of Fish and Game, and the San Diego Zoo Institute for Conservation Research. The initial reintroduction effort of this species occurred in April 2010 when about 500 eggs were released into the stream in hopes of successful hatching. The tadpoles from that release of eggs are so small that it has been difficult for scientists to determine how many survived. The first-ever tadpole reintroduction for the species occurred in August. By “head starting” the tadpoles, partners hoped to increase survival in the wild. The release was conducted using both caged and free-swimming tadpoles. 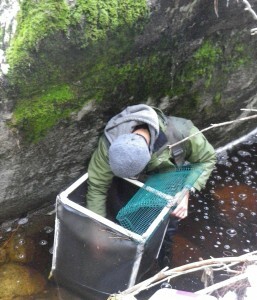 Eighteen tadpoles were released immediately into the stream while another 18 were put into a cage in the stream; the cage protected the tadpoles from predators and also allowed researchers to feed them. Each grouping was tagged with a different color marker. All 18 tadpoles in the cage survived the three-month period of reintroduction into the stream and were about 50 to 60 millimeters long (1 to 2½ inches) when they were released from the cage today. In the spring, scientists will go back to the stream and count the tadpoles to determine which of the release methods was most successful. The creek is frequently monitored and some of the free-swimming tadpoles from the August release have been spotted during these efforts. Globally, amphibians are on the decline because of habitat loss, effects of climate change, pesticide residue, introduction of nonnative species, and the spread of a deadly pathogen called the chytrid fungus. The mountain yellow-legged frog is one of three frogs or toads on the federal endangered species list in Southern California and has recently been proposed for listing under the California Endangered Species Act. Today, only a small wild population of less than 200 adult mountain yellow-legged frogs can be found in the San Gabriel, San Bernardino, and San Jacinto mountains. The San Diego Zoo Institute for Conservation Research was the first to breed the mountain yellow-legged frog outside of its native habitat. Historically, scientists have had great difficulty breeding frogs in laboratories. This year, Zoo scientists discovered that the frogs’ breeding behaviors increased in the lab after the frogs were chilled to temperatures that resembled their high mountain stream environment. Scientists hope the second year of breeding will result in an even higher fertility rate. The Zoo’s breeding program, in conjunction with its partners, began after a wildlife biologist with the San Bernardino National Forest noticed declining creek water levels in Dark Canyon in Riverside County in 2006. The Fish and Wildlife Service’s salvage effort started the next day. Recovered tadpoles were taken to the San Diego Zoo Institute for Conservation Research, where they metamorphosed into frogs. The James San Jacinto Mountains Reserve is one of 36 University of California run reserves throughout the state protecting over 135,000 acres. The Natural Reserve System was established in 1965 to protect and make available natural lands for research, university-level instruction and public outreach. The system of reserves broadly represents California’s rich ecological diversity, provides protected locations for long-term study and opportunities for outdoor education. The NRS is the largest university operated system of natural reserves in the world.